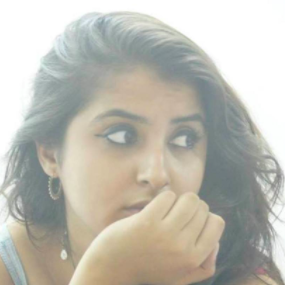 Ram aur Leela *finally* ek hue! 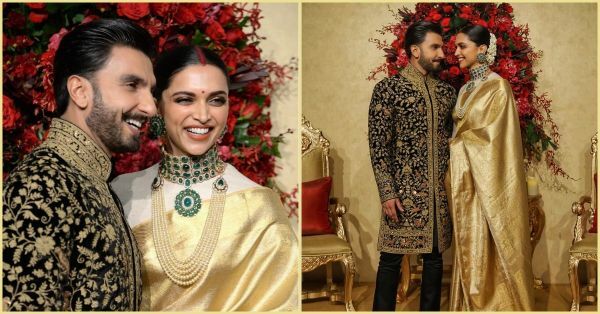 The country's sweethearts, Deepika Padukone and Ranveer Singh tied the knot in a dreamy Lake Como wedding and you've got to bring out the kala tikka! After all that fun, they are now in Bengaluru for their reception party and they've given a whole new dimension to the word 'regal'. We're all going gaga over DeepVeer's love and we have refreshing our Instagram feeds constantly to get all the updates on the happily married couple. Here are some of the deets we noticed that will make you go all gushy mushy! The royal couple descended the spiral staircase at the hotel like a king and a queen in romantic fairytale movies. I'm just reminded of one line from DP's debut film, Om Shanti Om, "Humari filmon ki tarah life mein bhi sab kuch theek hee ho jata hai - happysss endingsss!" The decor was minimalistic and even the staircase railing looked magnificent. There were blooming red roses all around, just like at Lake Como. While Din Shagna Da is every couple's fave wedding song to make an entry, DeepVeer took a completely different route. They entered the banquet hall while Lamborghini by The Doorbeen ft. Ragini was playing. It is a Punjabi hit number all set to get you to the dance floor. Unlike other B-town events (not to stereotype though), their wedding reception actually started on time. The media didn't have to wait, nor did the guests think it was fashionable to be late. We love a disciplined couple! Baba is always one of the most respectful stars in Bollywood. He's always talking politely to photographers, bowing with his hands folded and it's very humbling. Even today, he actually told the media present, "Khaana khaa ke jaanaa!" By now we all know that Ranveer is the man of Deepika's (and our) dreams. His grand gestures of love and his little moments of care have us falling head over heels in love with him. DP's pallu wasn't falling right, so her better half made sure it was a picture-perfect moment for the shutterbugs by arranging it himself. Love for all! Ranveer blew a tiny kiss to his wifey (for life-y) - he is just besotted by her. We love an expressive man, don't we ladies?! It's a blink and you miss it moment, but it's there. After all, Bajirao ne Mastani se mohabbat ki hai, ayyashi nahi! Earlier DeepVeer had sent out e-invites to all the guests who could enter the reception only after their barcode was scanned. Now, there were also reports that the dinnerware at the bash is also eco-friendly. They have everything made from sugarcane fibre instead of the usual plastic and styrofoam plates, and woah, applause! DP was still styled by Sabyasachi Mukherjee today as well, but Ranveer's dapper sherwani was designed by Rohit Bal. More about their ensembles here. For more updates on the Ram-Leela couple, stay tuned here!